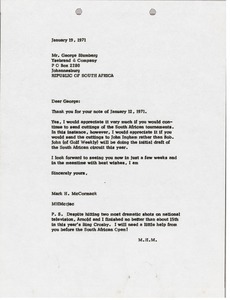 South Africa - Acknowledging receipt of the information on the tournaments played on the South African circuit. 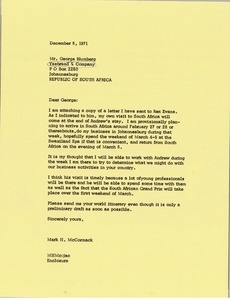 South Africa - Concerning the attached letter from Julian Knights and McCormack's response. 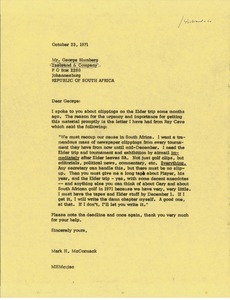 Knights' letter not enclosed with letter. 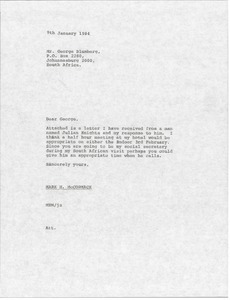 South Africa - Requesting Blumberg continue to send South African tournament clippings and specifically requesting clippings be sent to John Ingham instead of Bob. A post script comments on McCormack and Arnold Palmer's performance at the Bing Crosby tournament. 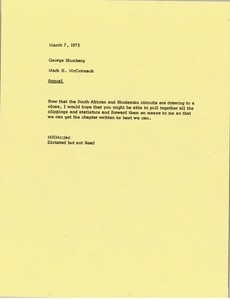 South Africa - McCormack asks Blumberg to send newspaper clippings on the Lee Elder trip to help recoup their cause in South Africa, including a quote from a Ray Cave letter expressing urgency for the clippings. 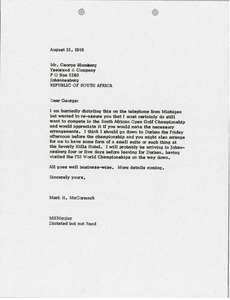 South Africa - McCormack confirms his desire to participate in the South African Open Golf Championship and asks Blumberg to make arrangements. 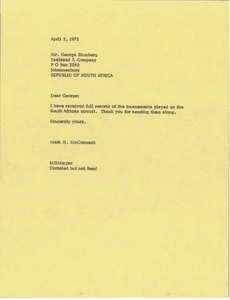 McCormack then notes his general itinerary and requests a suite in the Beverly Hills Hotel.